Why are people held in Harku detention center? What are their migration stories and on which legal grounds are they being detained? Why are human rights organisations concerned about living conditions in Harku? What are former detainees reporting about their experiences in Harku? What happens to people who cannot be deported, but also cannot be detained endlessly? 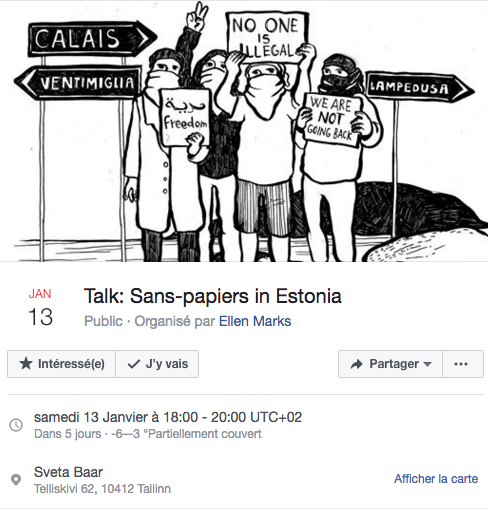 What are the grey areas in Estonian migration law that produce undocumented persons without any legal rights and no perspective for legalising their residence? How can ordinary people support undocumented persons? We will discuss these questions on the example of a video by Eléonore de Montesquiou. The video presents an interview with a refugee who was detained in Harku for 3 years. He speaks about his experiences with police. 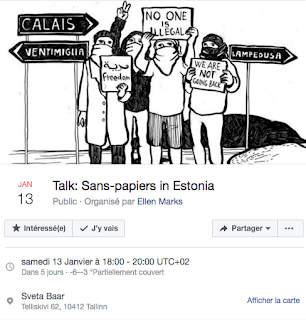 After the video screening, there will be a discussion with inputs by Eléonore de Montesquiou and Harku Solidarity Group. We will contextualise and discuss the video, also addressing broader issues about Harku detention center and undocumented migrants. Eléonore de Montesquiou is an artist based in Berlin. For many years she has been making documentary videos about the Russian-speaking community in Estonia, creating visibility for voices that are otherwise rarely heard in the public space of Estonia. In the recent years, Eléonore has made a number of videos with refugees who speak about their experiences of being detained in Harku. Harku Solidarity Group is an anti-racist network that makes weekly visits to Harku detention center. They will share observations about the human rights situation and problematic issues in Harku detention center. ***The discussion will take place in English language. We can provide whisper translation into Estonian and Russian. If you need translation into other languages, please get in touch with us in advance.